Whenever I visit my childhood home, something peculiar happens to the grown-up me. This time, I've managed to not lose my mind completely (only been here about 30 hours though). Nor have I had any tension headaches or clenched jaw moments. I have, however, fallen into that I just want to lie down and sleep feeling. Which makes for crappy blogging, as you can attest to at this very moment. And that, I believe, calls for a cute boy picture to make things all better. I prefer to fantasize think about him more as The Namesake than Kumar, for the most part. Not that I've put a lot of thought into it or anything. You are not making me look forward to my in-laws upcoming visit--especially after reading your link post. Hang in there, baby. It will all be over soon. 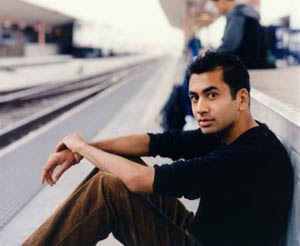 um...why is MY kal penn on YOUR blog? i'll just brb after i post a picture of YOUR wild oats checker on MY blog. At least you're sharing good shots of hot men...sorry the visit isn't so great. See, I need to see The Namesake, because to me he is just kind of irritating Kumar, with a side of "that guy who's now on House". He has the most slender arms I've seen in a hen's age. And Yes, we sometimes talk like that here in the hinterlands. Or I do. Wish I had visited Oak Harbor while my brother was stationed there!